Prince Edward Island is famous for its spectacular coastline. Yet this provincial treasure is densely settled, making it a major challenge to find and protect substantial pieces of undisturbed coastline. 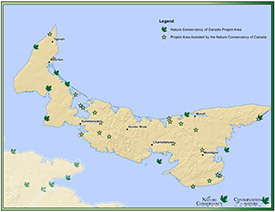 By using conservation strategies developed specifically for privately owned land, the Nature Conservancy of Canada (NCC) and its partners are helping safeguard the natural heritage in a province where more than 90 per cent of the land is in private ownership. The sand dunes of PEI remain relatively intact as an ecosystem. But, they are under threat from encroaching human habitation and recreational use, as well as from sea-level rise. The off-shore islands are secluded nesting sites for great blue herons, which feed in the shallow tidal water surrounding the islands. Salt marshes have been used for various purposes since European settlement, but most have reverted to natural conditions. Some salt marshes have been lost due to infilling or conversion to fresh water impoundments for waterfowl production. However, those that remain are highly productive natural systems used by both nesting and migrating birds. The willet, black duck and sharp-tailed sparrow are marsh residents, as are salt-tolerant plants such as salt-meadow cord grass and sea-milkwort. 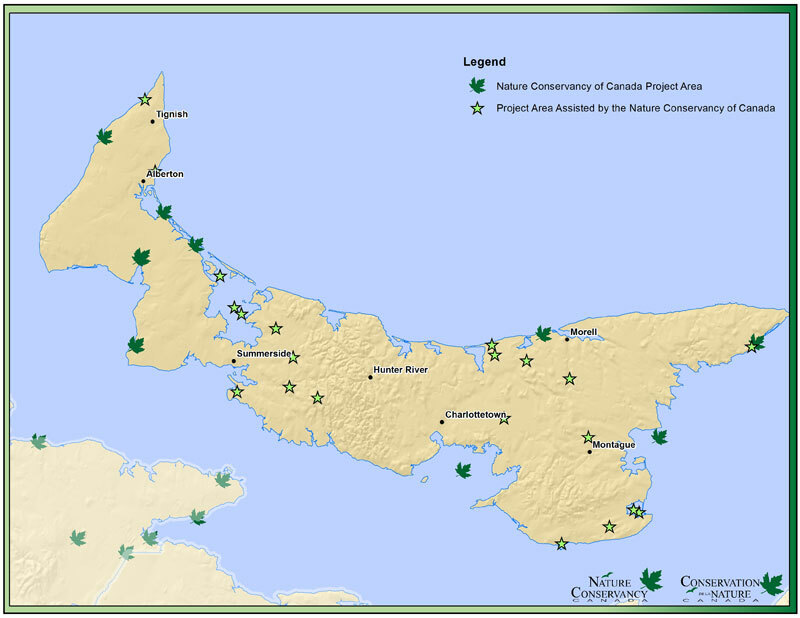 Almost nothing remains of PEI's original old growth hardwood Acadian forest. Clearing for agriculture and timber harvesting for shipbuilding and other uses have reduced these forests to a mere fraction of what they once were. The remaining stands of hardwood Acadian forest are all the more precious for the plants and animals that thrive in these woods, including songbirds such as the blue-headed vireo, Swainson's thrush and black-and-white warbler.